Last week, David Ker wrote a CyberPsalm in the form of a prayer for a friend and coworker, Ada, who is battling cancer. I also know Ada, though it has been years since I’ve seen her. Several mutual friends have written me recently, asking me to join them in praying for her. During this same time, my heart has also been heavy for H., a man in the church I attend now, who is battling a similar cancer. I found myself struggling in my prayers for him, and that struggle was compounded in my prayers for Ada. I have walked through some very painful things in the last few years. And through the process, I have experienced the Lord’s faithfulness as I have clung to Him. Having more or less come through the worst of that time, I do not necessarily find myself to be more confident in my praying. If anything, the only spiritual practice I find my confidence increased in is lamenting. And so as I would try to pray for my suffering sister and brother, I could not find the words, only tears. Tears for them, for their spouses and children. I could feel edges of the pain and uncertainty and sorrows they and their families must be walking through. And yet the words to put in a prayer did not come. During my most painful days, I struggled with the things that God does not do and did not do for me. Now, I think I struggle more with not understanding the things he does do, and with wondering how on earth my prayers are supposed to fit into all of that. I find myself feeling something along the lines of, Lord, I know you can do anything, but as to what you want to do and plan to do…I just don’t know. And so my prayers (and some would say my faith) are weak and uncertain. And yet I continue to trust the Lord confidently with my tears–crying out and clinging to him, for myself, for my children, and in my longings and cries for Ada and for H. and for their families. When my friends asked me if I would write a prayer for Ada and send it along with the prayers of others, I wondered how I would send a feeling-prayer, instead of a word prayer. I cannot bottle my tears up and send them in the post or via email. 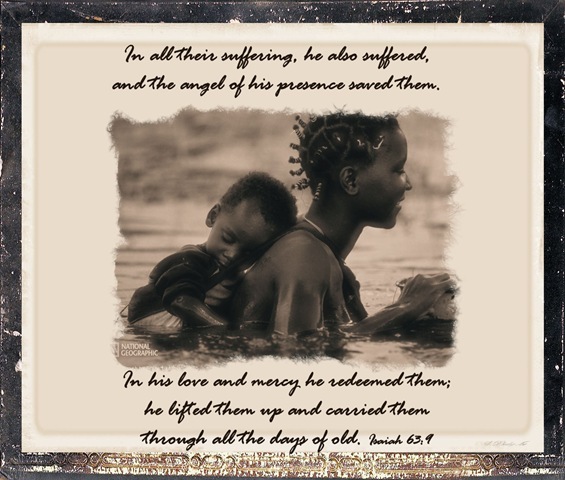 I did, however, have a verse that kept running through my mind as I thought of the suffering and sorrow Ada and H. are facing, and of all my unanswered questions about how to pray for them. A short while later, there was a beautiful photo* on my National Geographic Photo of the Day link. 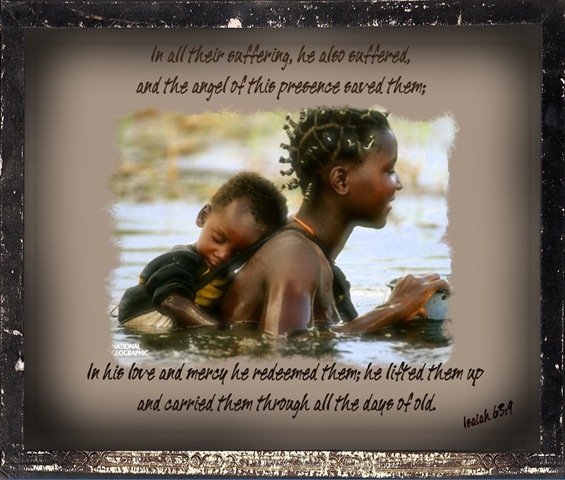 I ended up combining the photo with the verse, using my new Corel PhotoShop program. *This photo was the National Geographic Photo of the Day for May 10, 2009. Here is the description: “A Mbukushu mother and child cross Botswana’s Okavango River, whose seasonal floods bring life to a parched land.” You can see five more beautiful photos from the same book, Mothers and Children, at this link. Beautiful. What a lovely verse. There are so many different ways to pray, and it’s beyond my understanding that our prayers should work at all. I’m jusdt thankful that they do, or rather, that God works through them. and our wordless tears can be the most powerful prayer of all .. I found your blog on DM’s bloglist, and love what I’ve seen so far. 😀 And then I saw photos from National Geographic, and had to comment, because I LOVE that magazine, and because the pictures are so beautiful. And what a beautiful verse. Nice to meet you, Leah, and I’m glad you stopped by. I enjoyed looking around your blog, too. Absolutely beautiful – what an exquisite prayer. Wish I could download the picture and verse … don’t know how to, or maybe I’m not allowed to …? Anyway, much enjoyed! Thanks, June. I’ll copy it, shrink it and put it into the body of an email, and maybe you can get it that way.